If you don’t like cumin, step away. You’ve made up your mind about the spice, and no amount of my praising it will change the way your taste buds feel. So, I’ll see you another day, okay? But you cumin fans, lean in a bit closer—I have something to tell you. This stew … it’s awesome. Awesome as in delicious. Really. Super. Delicious. And it’s all due to the cumin. It being from Bon Appetit may explain why it’s so delectable. Theirs is a meaty version. I’m sure the addition of chicken thighs is nothing but fabulous. I didn’t have them on hand—plus I’m doing a no-meat kinda thing currently. Still, this rocks with out the cluck factor. -IF you’re going the chicken route, heat 2 tbs of the oil in a Dutch oven over medium-high heat. Season chicken with salt; add to pot and cook, turning once, until browned, 8–10 minutes. Transfer to a plate. -IF you’re not using chicken, heat 2 tbs of oil to medium low, add onion and garlic, and saute for 5-6 minutes or until onions become translucent. Add cumin, tomato paste and red pepper flakes; stir until a smooth paste forms, about 1 minute. -IF using chicken, add it back into the pot along with bay leaves and 4 cups water and dislodge any of the brown chicken bits that might be on the bottom of the pot. 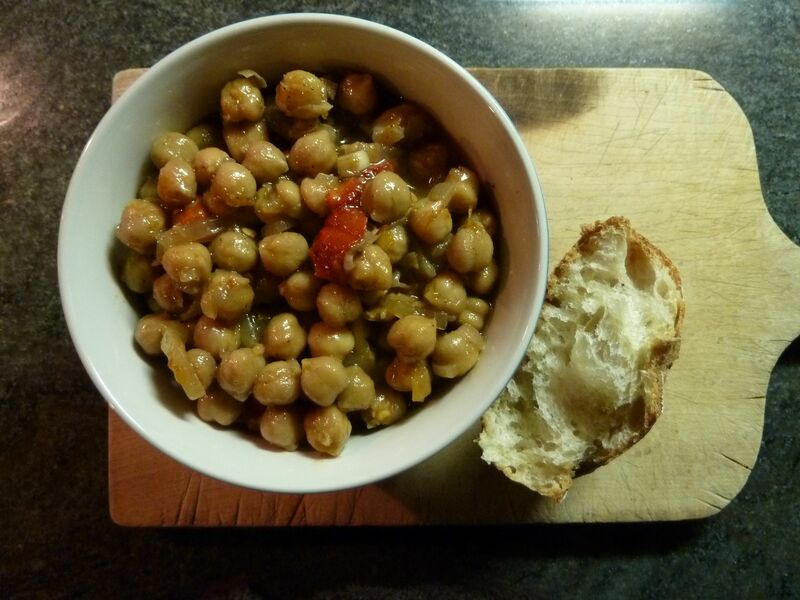 -Just a quick note: I used dry chickpeas and cooked them in a pressure cooker with 9 cups water, kosher salt, a celery stalk, a carrot, 2 bay leaves and 3 whole garlic cloves for 28 minutes. When I drained the chickpeas, I reserved the liquid and used that in place of 4 cups water. Mmmmm … more flavor. -Bring everything in the pot to a boil; reduce heat to medium-low and simmer, uncovered, with occasional stirring. IF using chicken, let it simmer until chicken is tender (20 minutes). Sans chicken, 10 minutes is enough to get the flavors to meld. -Transfer chicken to a plate (if it’s in there). Add chickpeas to pot and bring to a simmer and cook for 5 minutes. Shred your chicken off the bone and add it in there. Otherwise, skip it. Add in the red peppers and stir in remaining 2 tbs of oil (but only if you want – you don’t need to). -Don’t skip this part: Give it a taste. Good, right? Yummy power-packed cumin flavor. Okay, now add in 2 tbs of lemon juice (or about half a lemon). Let it simmer for a minute. Now give it another taste? Better, huh? Yup, that lemon is a major major plus here. Adjust seasonings with salt and maybe more lemon if you think it needs it. -Serving: Bon Appetit says to cube crusty bread, put it in an individual bowl, and ladle the stew on top. DO NOT even attempt. All you get is soggy bread. Bleck. But DO enjoy a nice slice alongside, dipping it to your liking. Oh, and sprinkle some parsley on top, too. Good, good stewy stuff. There’s no room for cumin haters here. I grew up on a farm. A real, working farm—one where my parents and us kids poured everything we had into coaxing things to grow from the soil, and cared for our 4-legged and feathered creatures until they were fat enough to fill our chest freezers. On a farm like this, you were clucking back at a chicken one day, and basting it the next. The big guys—the beef and pork animals—we kept penned up, either in the barn or in the field next to it. Chickens, too, were kept in the barn lest some malevolent creature pay them a visit. The ducks, however, were allowed to roam outside the barn and through our yard. Why? Not sure, really. They weren’t a flight risk—quite literally. They could fly up to the lower branches of a tree if their lives were in peril. But, as for wanting to leave the farm, that was just plain silly—they were quite happy where they were. Also, the ducks were really more of an accident than a part of our farm’s business model. We happened to find them—a half-dozen little ducklings—trapped in some viney, brambly undergrowth one day near our grandmother’s bungalow. It was a bit of a mystery how they ended up there, especially so when they matured and it turned out they were Muscovy ducks and not some random water fowl. That’s right, we were eating Muscovy duck in the 1970s, long before it became the culinary king. As will happen when genders mix, we found viable duck eggs, incubated them, and had a nice little gangs of Muscovys wandering our yard for many years. Now, one summer my mother wished to add a goose to the duck gang. We had never had a goose before, not in the barn nor on our plates. Goose for Christmas, Mom said. A little gosling was added to the bunch. Despite the moniker, we never had a chance to eat Willeeta. The curious goose, who was full of personality and quite a delight to have roaming the yard, met her end not by means of an axe. One day we were repaving our driveway with asphalt, and little Willeeta decided to have herself a taste of the hot and gooey black stuff. Within minutes she was foaming at the bill and not long after she was gone. We never did eat Willeeta. The irony. And, we never did raise another goose and never had goose on our table. Fast forward 30-some years to last Friday night. Jennifer and I stop in at The Gallows, the fairly new restaurant in the South End. The menu is meat-heavy, and not eating red meat, we’ve not made it a priority to dine there. There’s a bit of a Middle Ages feel to the menu, with mead and boar and such on listings. Drinks with dark-sounding names. Apps called “boards” and served up on small cutting boards. Wenches behind the bar. Men in furs bringing out the meals. Okay, I jest, but you get the idea. So, considering the story of Willeeta, you’ll understand that when the boards of the day were detailed to us, the goose board did have an appeal to me. Goose prepared three ways: pate, sliced cured breast, and something I didn’t quite catch the name of but it was a type of confit (but drier). Jennifer didn’t feel the same draw as I did to this goose board—having had a horrible experience with duck once, she stays away from fowl other than chicken. But, after relating the Willeeta story to our server, she gladly served up a small serving of the goose three ways. Pate: not for me. Sliced cured breast: very good. the confit-like dish: delicious. Would I have good again? Yes, but hold the pate. Jennifer and I did share the Ploughman’s Board, which was fish three ways. Smoked salmon – awesome. Cured trout – awesome. And some sort of lobster and red pepper pate was the best of the bunch. Was it lobster or tuna? I don’t recall, but whatever it was, I’ll gladly order it again. The board was accompanied with (not enough) hearty sourdough, a nice robust mustard and something that tasted like the beginnings of tartar sauce but was way more mayo-ey than I think they intended. Stick with the mustard. As I said, we only really stopped in to check out the atmosphere, grab a drink and quickly peruse the bar menu. We were pleasantly surprised at the non-red meat opportunities, both on the apps and the main entrees. Next time, we’ll do a bit more dining and let you know how it goes. You are currently browsing the poultry category at The Dainty Dot.